Best-selling author Sheri Rose Shepherd uses charming princess characters and easy-to-understand Bible stories to help share spiritual wisdom and truths in this sweetly illustrated Bible storybook. This is a wonderful introduction to the Bible for even the tiniest of princesses! Bible Stories for His Beautiful Princess is a fresh way to teach little girls?toddlers and preschoolers?the foundations of the Christian faith. Simple lessons on how to know God, learning to pray, having faith, and understanding right from wrong make this the perfect first Bible. Using charming and engaging illustrations on every spread, princess-themed lessons, and easy-to-understand verses from the NLT, this Bible storybook will get little girls excited about engaging with God?s Word. 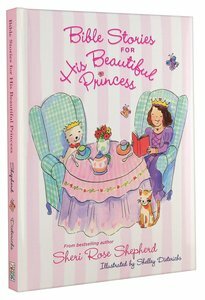 About "Bible Stories For His Beautiful Princess"